The only effective way of removing chewing gum and bubble gum is with the use of heat. We use hot water pressure washers and our machines can reach 150 degrees Celcius so the chewing gum/ bubble gum will dissolve when we clean it. We can also thoroughly clean the area during the removal process. For busy areas we usually can carry out chewing gum removal at night as this is usually more convenient for shops and schools as there is less pedestrian traffic and it will not affect your business trading. We can give you a free quotation based on your specific needs. 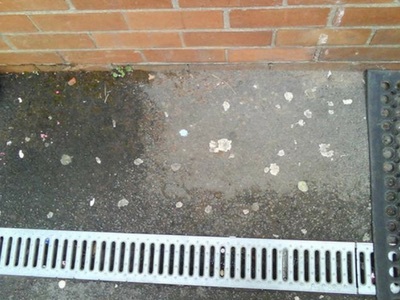 We have regular cleaning contracts with some of our clients where we will come once a year to remove chewing gum from a problem area making sure the chewing gum does not build up too much. If this is something you are interested in please get in touch for a free quotation.